Join their e-club and receive BOGO coupons, $25, 25%, 30%, and sometimes 50% off your meals. Print and present coupon upon arrival and receive $10 off a regular priced dinner per person valid up to 8 guests (Mondays thru Thursdays). Print coupon and save 15% on regular-priced dinner. Valid Monday-Thursday only. Print email for a complimentary dessert with purchase of a regular price lunch or dinner. 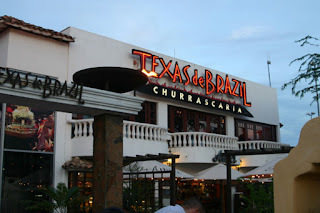 Texas de Brazil is an authentic Brazilian-American churrascaria (steak house) that combines the cuisine of Southern Brazil with the generous spirit of Texas. 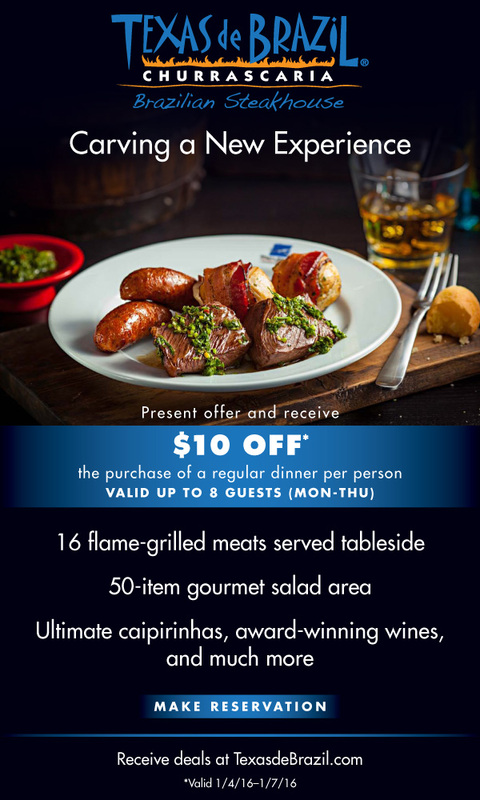 There’s nothing quite like a “Churrascaria” experience! At these Brazilian-American steakhouses, servers walk around with skewers of 16 different cuts of meat straight off the grill for you to choose from. Just ask and they’ll carve you a slice! The dining experience at Texas de Brazil also includes a large salad bar and side selection. Indulge in a steakhouse Brazilian-style without taking a hit to the wallet.